Eggs are an ancient form of nourishment for mankind. Eggs represent a significant physiological value as they contain an optimum proportion of practically all the nutrients, vitamins and minerals required by human nutrition. Gyermelyi Tojás Kft. is Hungary’s largest egg producing enterprise. We carry out our egg production activities using state-of-the-art technology on three egg farms under strict hygienic conditions. We purchase day-old chicks and rear pullets and laying hens on self-produced feed. Thanks to the high-quality feed and our strict sorting and storage practices, eggs released for consumption on the market have a high nutritional content and are guaranteed to be fresh. 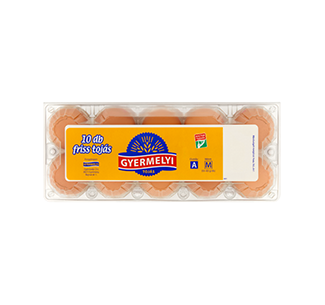 Apart from standard eggs, we also produce special products if the need arises. Our partners from the culinary industry are particularly partial to our disinfected products. Our product range now includes Extra yellow eggs.